you can try this out http://dougcoleman.net/?author=19 Why are we listening to the Bush administration officials anyway? They didn’t get Bin Laden. They’re like the Winklevoss Twins of getting Bin Laden. 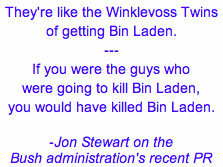 If you were the guys who were going to kill Bin Laden, you would have killed Bin Laden!